A little while ago I wrote about my visit on Press Day at this show in the Exel Exhibition Centre in Docklands. Since then I have some additional statistics that may be of interest. Apart from all the parts, clothing and accessories stands at the show, there are 800 boats in the 80,000 square metre exhibition hall, including a 74 foot motor cruiser costing around £2M. In additiion to this, a further 50 arrived by water and there is 400 metres of dockside. 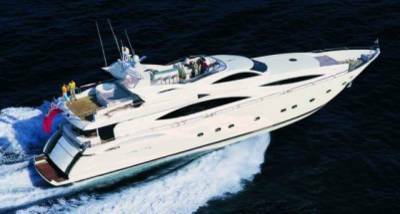 The costliest and largest exhibitor boat is the 105ft Sunseeker valued at around £5M – depending on how you decide to have it fitted out. However the largest “feature” boat is HMS Sutherland, a type 23 frigate. 436 feet and a displacement of 4,900 tons! Goodness only knows how much that has set you back – you are a tax payer, aren’t you? The show took 17 days to set up and will probably take 6 days to dismantle. Over 200,000 visitors are expected over the 11 day show. This lovely craft is a 105 Sunseeker yacht 101ft 8ins (LOA). It is powered by a range of options. 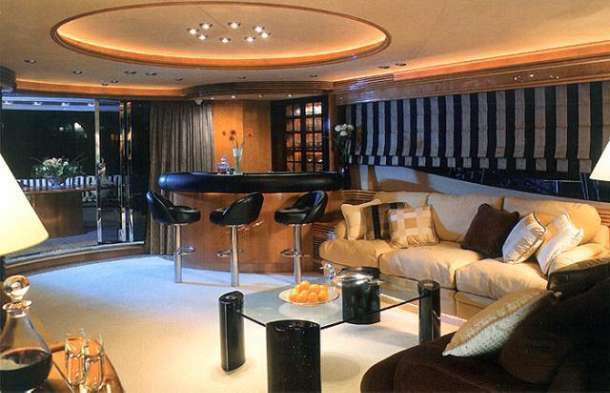 There are 13 berths which is even enough so you can take your Mother-in-Law! And the lounge and bar would be my quarters, apart from those awful hours having to sleep! That’s my seat, on the right, away from the sun (the seats at the bar – of course). For those techical minded amongst you, take a look at the full print out of what is available. One web page but yards long, full of every little detail you can imagine! There are also more photographs on this page. So, who has £5M to spare? “You, Sir?” Well, it won’t be enough. Have you forgotten the cost, a full tank takes 14780 litres of diesel. and with a maximum speed up to 31 knots and range at cruising speed up to 600 miles or at 12 knots up to 1200 miles – over 12.3 litres a mile – it’s going to cost a few bob. Then there’s the Captain, Engineer and Navigators salary, with extra crew when you use the boat. I mean to say, you aren’t going to want to clean up after you, and make your own beds, are you? Then you won’t want to travel half way across the world on the boat at those speeds – you’ll want to send it on ahead and when it arrives, travel there in your nice comfortable LearJet! The link, below my “sign-out” will take you to the main Sunseekers website.